In this tutorial, we’ll create a small skillbar consisting of 4 slots and bind the slots to Input Keys (1-4). You can learn more about the Shortcut Slot System in this how-to. We need new input keys for our hotkeys to call the shortcuts. Open the ORK Framework and navigate to Base/Control > Input Keys, add four new input keys and change the following settings. Binding input keys to shortcut slots is done with Control Maps. We’ll create a new control map for the shortcut hotkeys, so we’ll also need to add it to the player’s combatant afterwards. Navigate to Base/Control > Control Maps, add a new control map and change the following settings. Enable Field and Real Time. While you can also use hotkeys in other battle types (e.g. turn based), it doesn’t really suit the ORK demo’s gameplay. Click on Add Control Key to add the first key. Copy the first control key and change the following settings. Again, copy the last control key and change the following settings. One last time, copy the last control key and change the following settings. Now it’s time to update our player’s combatant – we’ll add the new control map and some default shortcut assignments. 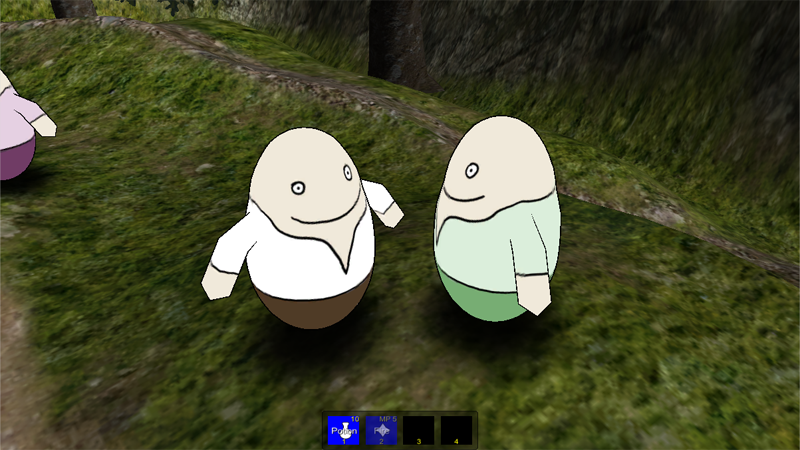 Navigate to Combatants > Combatants, select Brown Pants (the player) and change the following settings. Click on Add Control Map to add the control map we just created. The Shortcut Settings can be found in the Battle Settings of the combatant. If enabled, the combatant would use the shortcut settings defind in it’s current class – this allows having different shortcuts for each class. For our example we only need one set of shortcuts for our combatant. You can have as many shortcut lists as you need, but only the currently active list can be used at a time. Click on Add Shortcut in Default Shortcuts to add a default shortcut assignment. This will add the default shortcut assignment to the first shortcut list (indexes start at 0). We’ll skip index 0 for cosmetic reasons, we want to bind input key 1 to slot index 1, key 2 to slot 2, etc. Click on Add Shortcut to add another default shortcut assignment. That’s it for the combatant – we’ll only assign 2 of the 4 slots we want to display to have some free slots for the player to assign. Of course, the player could also assign new shortcuts on already assigned slots. We’ll create a new GUI box to display the skillbar at the bottom center of the screen. The skillbar will be created using a HUD, which should also be dispalyed in menu screens where we can assign shortcuts using drag+drop. To make sure the HUD is displayed above the menu, we’ll add a new GUI Layer the GUI box will be displayed at. Navigate to Menus > GUI Layers, add a new GUI layer and change the following settings. Set to HUD above Menu. GUI layers are displayed above each other – i.e. layer 0 will be displayed below layer 1. Now, navigate to Menus > GUI Boxes, add a new GUI box and change the following settings. Set to X=640, Y=800, W=250, H=70. And that’s it for the GUI box. Finally, we’ll create the HUD to display our shortcut slots. Navigate to Menus > HUDs, add a new HUD and change the following settings. To allow the HUD receiving drag+drop input, we need to enable this setting. Enable Player, disable Ally and Enemy. Click on Add Status Element to add a new HUD element. This will swap slot assignments when assigning shortcuts from with in the HUD. The Empty Slot Display settings are used for not assigned shortcut slots. Click on Add Content Text to add a text label to the empty slot display. We’ll use it to display the slot index, which is also the hotkey. The slot index will be displayed at the lower center of the slot. The Assigned Slot Display settings are used for assigned shortcut slots and can display information about the assigned action, e.g. use costs, icon, name, etc. We’ll use 4 labels to display the assigned slots, one for the icon, one for the name, one for the use costs/quantity and one for the slot index. The higher indexed labels will be displayed above the lower indexed ones. Click on Add Content Text to add the first label for the icon. Copy the icon label and change the following settings to display the name. Click on Add Content Text to add the info label (use costs, quantity). Copy the info label and change the following settings to display the slot index (like in the empty slot). That’s all for the slot displays. Finally we’ll set the Element Bounds. And that’s it for the HUD. In order to assign shortcut slots using drag+drop from menu screens, you need to enable this also in the different menu screens. Navigate to Menus > Menu Screens, select Inventory and change the following settings. That’s it for the inventory menu screen. Select the Abilities menu screen and change the following settings. Now you’ll see a skillbar at the bottom of the screen, assigning slots can be done using drag+drop, using slots can be done using the hotkeys or also using drag+drop.